Graphic design, branding, search engine optimization, web site development, creating the energy and buzz for success… that’s us. You know the person that can do everything? No matter what you need, they can help? We’re not that person. We are very good at a few things… and that’s what we want to do. 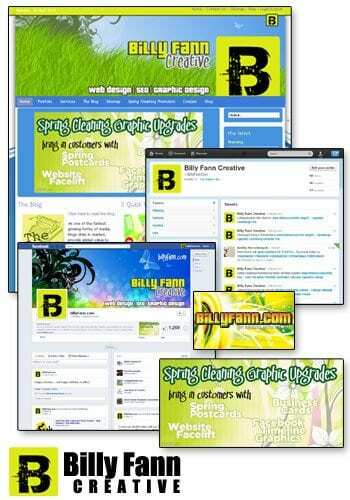 Billy Fann Creative will provide for the needs of your web site or graphics project. If we don’t already offer the service you need, we most likely have someone in our network who does. We are a creative team locally offering web, SEO, social media marketing and graphics in Knoxville, TN and worldwide. Give us a call at 865-951-7173 or use the Contact Us page. We like to work with small to medium sized boutiques and creative houses on an as needed basis. We prefer to work directly with you. These are the tools we use the most. For each project, we need to know what you envision. We also need to know what your customer wants. An important part of our process is gathering information and brainstorming. We try to see things from your customer’s point of view. We poll them. We ask for guidance. We revise. All to learn how to excite your particular customer. BillyFann.com creates search engine friendly sites. We practice search engine optimization (SEO) from day one. The content we put on your site will be ready to rank in the search engines. From there, you can choose the level of optimization you want. If you want us working on your rankings daily, we will. For many clients, monthly is aggressive enough. You will learn more on proactive versus reactive search engine optimization as we move along. Basically, SEO means anticipating what your customer will be searching for, and creating a page that matches that anticipation. Do you have a smart phone? If so, you’ve already seen mobile websites. Google ranks you higher if you have a mobile site. I prefer using the full-site version on my iPhone, but the mobile version of the site is useful when I need to do something quickly. To make a profit on the web, you really need to sell on the web. We can pair you with the right shopping cart for your needs. We know a service business doesn’t need the same website as a business selling DVDs. Our shopping cart solutions are fully integrated into your site. Your product may be perfect for selling through affiliate vendors like Amazon, Ebay, and Half.com. We’ve spent many years as vendors for affiliate sites, for both ourselves and our clients. They make money for you, establish your brand, and help build search popularity for your product. Craigslist.org can be very useful, too. If you don’t already offer credit cards online, there are many good solutions. Three of the most popular are Paypal, Square, and Authorize.net. We can help you make sure you choose the right options for your business and integrate the solution into your website. If you already take credit cards, we can work with your existing provider to find the best solution for you. Through the internet, we design for people all over the world. We are a small but productive team. Two of our best features are our eye-catching graphics and the way we work with your message. We know a lot of people. If you need fulfillment, television advertising, CD & DVD manufacturing, music production, or a submarine built, just ask. We’ll be happy to give you a solid referral. We create unique solutions to your toughest marketing and design problems. Contact us today to find out how Billy Fann Creative can help. Posted in Education, More info, Services, Website Design.